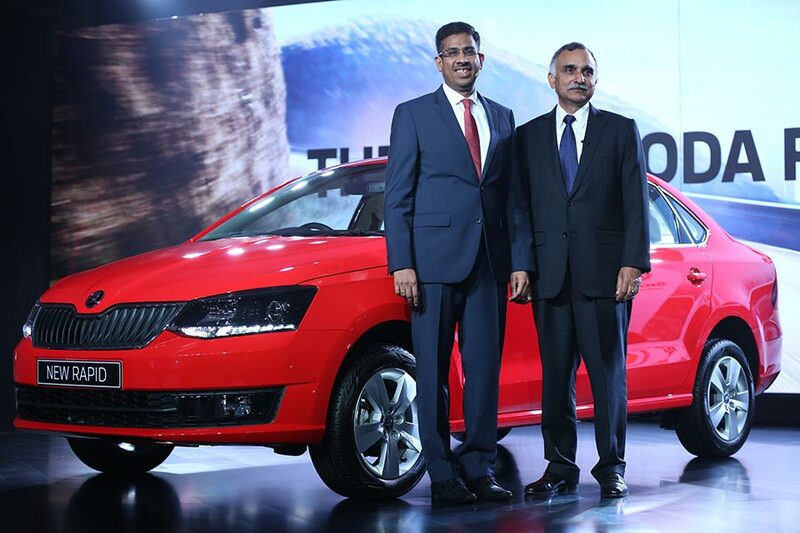 SKODA AUTO India today launched the New Rapid, which offers better performance combined with the new crystalline design language, tailormade to the needs of the Indian market. The New Rapid will be available to consumers at an attractive price of INR 8.34 Lakhs (Ex Showroom Maharashtra). Customers can now choose between a New Rapid powered by a 1.6L MPI petrol engine or the New 1.5L TDI diesel engine. In addition, the New Rapid will feature the efficient and dynamic 7 speed DSG gearbox with Tiptronics mated to the 1.5 TDI diesel engine. With six exciting colour options (Brilliant Silver, Candy White, Cappuccino Beige, Carbon Steel, Silk Blue and Flash Red ) accessible in 3 variants: Active, Ambition and Style, the New Rapid will be available across all authorized ŠKODA showrooms in the country. said Mr. Sudhir Rao, Chairman and Managing Director ŠKODA AUTO India. The New Rapid offers a compelling combination of the brand’s emotional design, exquisite interiors, host of convenience features, leading safety as well as intelligent connectivity features. An improved ownership experience, an ongoing model offensive strategy combined with the launch of the New Rapid will consolidate our growth going forward. The New Rapid positioned at the top end of the segment is a family car, compact enough for the city and spacious enough for longer trips. By offering more performance, an emotional design, class leading safety equipment and Simply Clever features, we expect the Rapid to dominate the upper end of the C segment. The New Rapid sports a modern crystalline appearance synonymous with the brand’s signature design language. In its sharp angles and contours, trails the inspiration to traditional Bohemian crystals, making it a very attractive sedan. 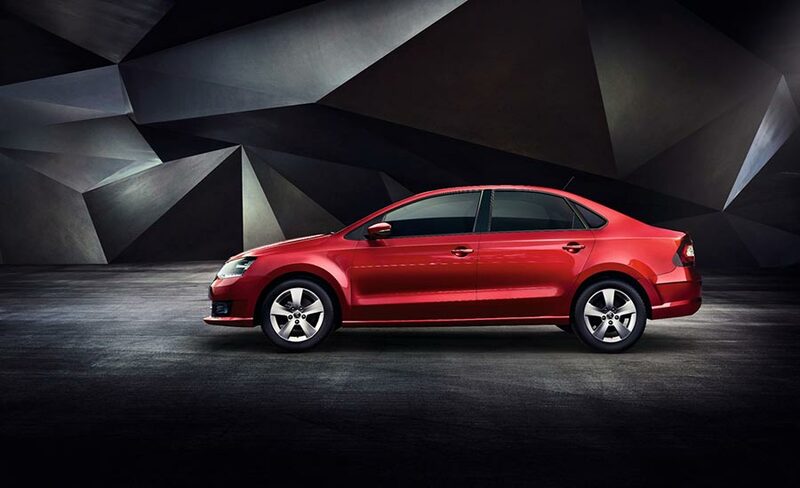 The inspiring design is a tribute to ŠKODA’s rich Czech heritage. The highly impressive exterior design is modern and emotionally appealing. The exquisite crystalline appearance runs across the bumper and fender. The dark facade of the New ŠKODA Signature Grille is perfectly complemented by its chrome surround. The new aggressive front dons sharp, precise and angular lines on the bonnet which gives the car an aggressive stance. The New Rapid is bundled with a whole host of exterior enhancements such as Quartz-cut Halogen Projector Headlights with manual leveling function. These are further enhanced by the mesmerizing chrome eye lash effect of the LED day running lights. The revamped classy shoulder line complements the New ŠKODA C-shaped Smoked Taillights presenting a more aesthetic and robust appearance. The chrome molding on the deck lid and chrome finished door handles further accentuate the premium appearance. The New Rapid’s new interiors are equally captivating. The car comes with contrasting Dual-tone Ebony-Sand interiors, featuring premium perforated leatherette seats. Abundant Chrome décor is a constant reminder that you’re never too far from luxury. Besides setting the perfect vibe, the AmberGlow Footwell Illumination makes ingress and egress much easier. New Leatherette lined door armrests add to the feeling of luxury. The attractive design of the new Rapid seamlessly lends itself to the luxury features, the result – so much comfort, you’ll wish your journey was your final destination. Considerate touches include features like the height and length adjustable multifunction steering wheel, electrically foldable and adjustable mirrors with side turn indicators. Presenting ‘Drive’ – the state-of-the-art 6.5 inch, Colour Touchscreen Central Infotainment System in your Rapid – to give your drive the experience it deserves. ‘Drive’ comes equipped with MirrorLink™ technology which will ensure seamless connectivity with your smartphone to keep you connected on the go, while also supporting USB/Aux-in/Bluetooth/SD Card options. The Rapid comes with revolutionary Climatronic technology along with adjustable dual rear AC vents thus making the car your utopia of comfort. The plethora of features don’t end here. The ŠKODA Rapid surprises you with an intelligent Rain Sensing Wiper system, the technology intuitively activates itself on detecting rain and adjusts the wiper’s frequency. The built-in cruise control, adjustable headrests and foldable armrests, thoughtfully cooled glove box and leading leg room make the Rapid even more compelling. 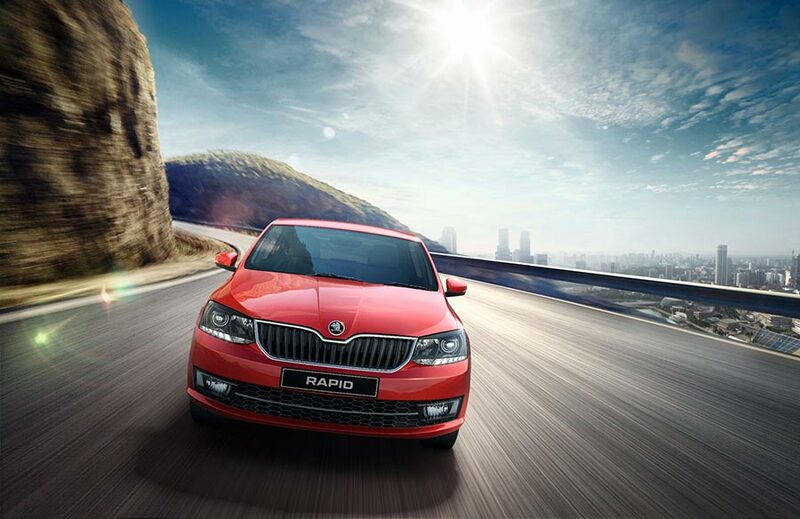 At ŠKODA, safety is a priority and not an option. Which is why, we offer important safety features like dual airbags and ABS as standard across all Rapid variants. The projector lens Quartz-cut headlights along with LED Day Running Lights never fail to make their presence felt. Safety is enhanced with state-of-the-art technologies like Electronic Stability Control and Hill Hold Control. A host of supporting functions include Parktonic Rear Parking Sensors, Automatically dimming rear view mirror and One Touch Anti Pinch technology for windows. The New ŠKODA Rapid has a generous heart and comes with two engine variants: a New 1.5L TDI diesel engine and the 1.6L MPI petrol engine. The 1.5 litre TDI produces 110PS (81kW) of power and a torque output of 250 Nm while delivering fuel efficiency figures of 21.72 kmpl (DSG) and 21.13 kmpl (MT). The 1.6 litre MPI or the Multi-point Injection engine is at the core of the Rapid’s Petrol Variant. With Dual Overhead Camshaft (DOHC) 16 valves, it delivers 105 PS (77kW) of power and a peak torque output of 153Nm while delivering fuel efficiency figures of 15.41 kmpl (MT) and 14.84 kmpl (AT). Don’t let the luxurious comfort features of the Rapid mislead you – the DSG transmission with Sport mode and Tiptronics will leave you overwhelmed. The New Rapid boasts of a 460L boot space and other intelligent storage solutions with bottle holders in the doors, storage compartment under front Centre armrest and cup holders in front as well as rear. 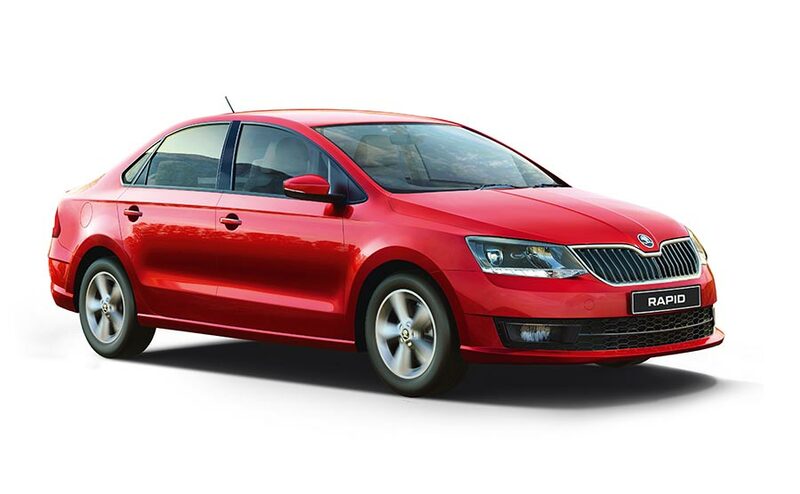 ŠKODA AUTO India recently introduced a new campaign intended to transform the overall ownership experience. As part of this initiative, ŠKODA will revamp its entire network including sales and service outlets. The modernized appearance is based on the New ŠKODA corporate design & identity. ŠKODA has also launched the ‘MYŠKODA’ mobile application which will provide customers with comprehensive information, data and facts about their ŠKODA. The application has been designed to allow ŠKODA owners to access their previous service records, predict next service, call for Roadside Assistance, locate the nearest ŠKODA dealership etc. amongst many other features. Through this campaign ŠKODA has introduced compelling service initiatives such as menu pricing, itemized service invoices and delivery assurances. ŠKODA recently announced its 4 year service care program which consist of a 4 year warranty program and a 4 year (24 x 7) Road Side Assistance which is standard on all SKODA’s. Additionally, customers now have an option to purchase a 4 year service package at a nominal price which ensures a hassle-free ownership experience. Want to add more to this story? Comment below.